The Fairy, or Fairies have a long standing history throughout Celtic lore. Fairies are the medieval and post-medieval versions of the old Celtic “spirits of the place”. 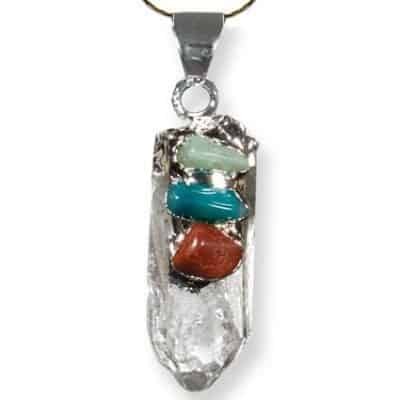 These stones are beautifully dyed clear quartz representing the metaphysical powers of clear quartz (the stone of power, clear insight and high vibrational energy) along with the power of their color! 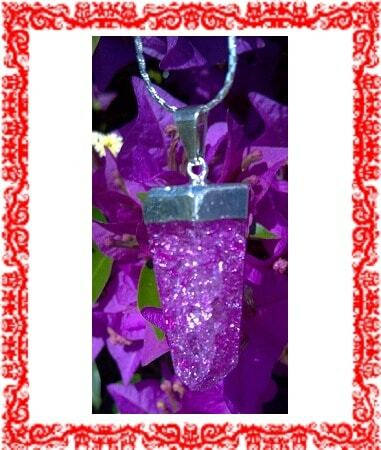 Each pendant represents a particular “fairy realm” and coordinates with the color of each sacred place. 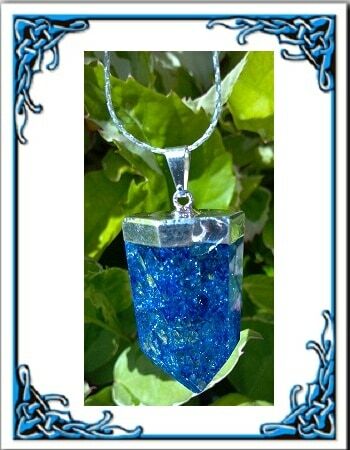 The Blue Sylph: This pendant represents the “spirit of the air”. 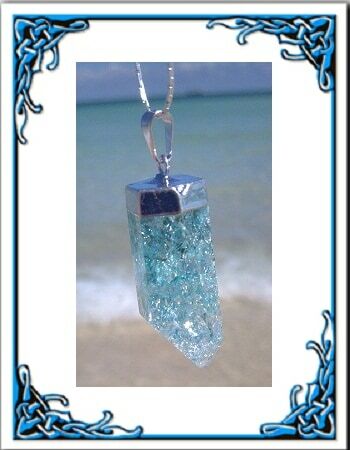 Etheric sparkling blue honors the gentle breeze and mischievous wind. 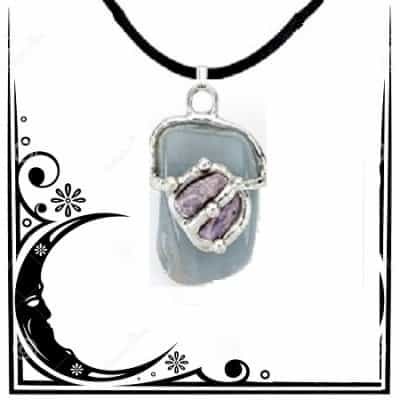 Winding its way through the plants and trees, pushing along the water and whipping up the dust, the pendant expresses the “free and flowing spirit of carefree energies! The Red Pixie: This pendant represents the easily startled, envious and constantly curious fairy folk who are always getting into trouble! Rambunctious, with boundless energy and a true sense of the supernatural! Red is the color of fierce fire, kenetic energy and self power. The Flower Fairy: This pendant represents the gentle spirits of the earth who live among the flowers and near the bottom of trees. Waking with the early morning sun and wisking away the morning dew, these helpful creatures of unconditional love and promise offer a positive outlook on all they touch. The Sea Nymph: This pendant represents the ease and flow of the alluring aqua blue sea! Taken to the sea in the form of merrows, these creatures guide lost fisherman, protect swimmers and fratrinize with the mermaids. 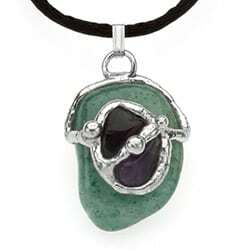 These pendants are capped with a silver electroform top and embellished with a 24″ electroform cobra chain. They measure approximately 1 1/4 inches from tip of point to top of bail. (Please note: these octagon bails have tiny little “fairy dents” along the edges where obvious mischief has taken place). 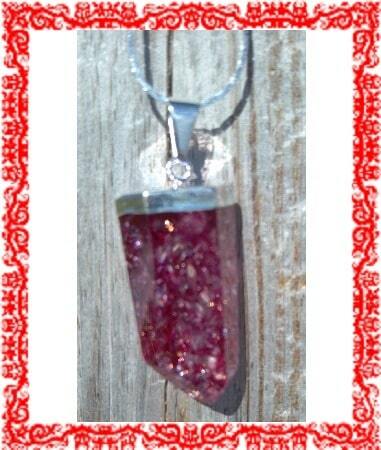 None-the-less, the stones are perfect sparkling specimens of “fae perfection”.